Shooters nationwide, fearing that surplus U.S. military brass would no longer be available, protested loudly to members of Congress and Department of Defense officials. We are pleased to report that the “mutilation” requirement has been rescinded, and vendors such as Georgia Arms and GI Brass will continue to sell reloadable surplus cartridge cases obtained from the U.S. military. 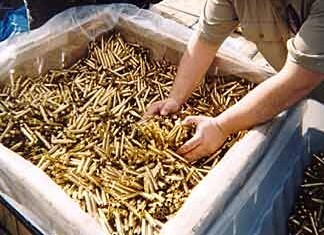 The Department of Defense (DOD), on behalf of all the branches of the military, collects fired shell cases. Rather than sell surplus brass directly, the DOD has disposal contracts with DOD Surplus, LLC and Government Liquidation, LLC, two private companies. These companies aggregate and sell the brass in bulk to wholesalers, primarily through online auctions. DOD Surplus, LLC had notified Georgia Arms that future lots of surplus brass would be subject to a NEW multilation requirement, effectively rendering the brass useless for reloading. Where did that “mutilation” requirement come from? Was this some evil, new directive from the White House? Apparently not. Here’s what happened. Surplus brass has been handled under a “DEMIL B” product category. Prior to 11/2008, DEMIL B items required no mutilation for sale to the public. That policy changed last November, but several exemptions (waivers) were granted. Expended munitions brass was covered by a waiver. After the new administration took office, some new manager, probably in the Defense Logistics Agency (DLA), eliminated ALL exemptions for DEMIL B products. Why this was done, we don’t really know. It appears no consideration was given to the impact on the shooting industry. But this elimination of the DEMIL B brass waiver was communicated to DOD Surplus, LLC last week. DOD Surplus, LLC, in turn, told its purchasers that milsurp brass would have to be mutilated (rendered unusable) from here on out. Yesterday, March 17, at 5:15 pm a letter cosigned by Senator Tester (D-MT) and Senator Baucus (D-MT) was faxed to the Department of Defense asking DOD to reverse its new policy requiring destruction of fired military cartridge brass. That joint letter, combined with thousands of email messages sent to Washington, convinced the DOD to reverse the recent change in surplus brass policy. At 5:30 PM on the 17th, the DOD faxed Senator Tester’s office announcing that the policy requiring multilation of surplus brass had been rescinded. Specifically, surplus military cartridge brass has been reclassified as a “DEMIL Q” product (not “DEMIL B” as before). DEMIL Q requires no product mutilation unless the item is sold to a foreign country. Share the post "Surplus U.S. Military Brass Remains Available — Mutilation Orders Reversed"
Berger Bullets has kicked off a special sale on Berger moly-coated bullets. Berger let us release this information first in today’s Daily Bulletin, so that AccurateShooter.com readers will have “first crack” at these super deals. Bullets must be paid by credit card only unless someone has already established an account with us. Berger will NOT not hold bullets for payment by check. Add a 5% discount if you buy ALL available boxes of a given caliber, weight, and style. Orders placed for 30 boxes or more get free shipping. Place your order with Andrea Cobos at (714) 447-5456 or contact andrea.cobos [at] bergerbullets.com. NOTE: The bullets listed above will remain in production in “naked” form, without moly-coating. These bullet designs are NOT being discontinued — just the moly-coated versions. Share the post "Berger Moly Bullet Close-Out Sale — Awesome Deals"
John Loh produces some of the most beautifully-machined shooting hardware on the planet. 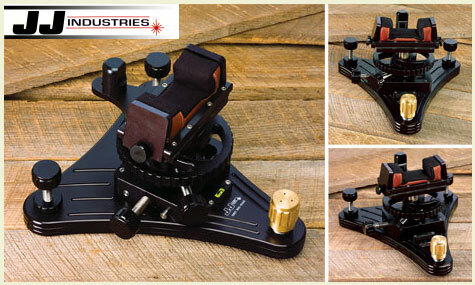 The Loh pedestal from JJ Industries is truly the “Rolls-Royce” of conventional (non-joystick) front rests. This editor has tried all the premium joystick (co-axial) rests, and numerous windage-top conventional rests. The Loh has the smoothest, steadiest horizontal tracking of any rest I’ve ever tried. F-classers who prefer to “hold-off” rather than dial clicks for windage changes will absolutely love the Loh. The vertical controls are extremely precise and allow you to make very minute movements of the cross-hairs with none of the “notchiness” or jumping you’ll find with some other models. Share the post "John Loh Front Rest Now Offered by Sinclair Int'l"